5-year-old Sam was bullied for wearing nail polish to school but decided to keep wearing it after receiving widespread support, including celebrities like Rob Gronkowski. When his son came home from school crying after being bullied for his nail polish, Twitter-user Daddy Files shared a thread about the incident to start a conversation around toxic masculinity. He tweeted, "This is my son, Sam. He’s 5. And today he learned how sh*tty and harmful #ToxicMasculinity is. 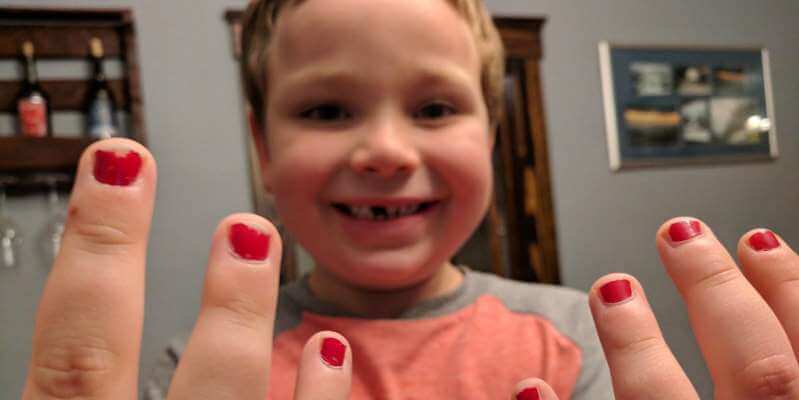 My rage meter is spiking right now so excuse me if this is a little raw but there are some things I want to say about BS #gender norms (a thread)"
He went on to describe how Sam, a lover of trucks and sports, also loves to have his nails painted bright colors. He had them painted at school and, to Sam's surprise, the other kids bullied him, calling him names and telling him to take off the polish. They had a conversation about Sam's experience. "I told him it doesn’t matter what anyone else does because what you wear and how you look should make YOU look good." Sam, still unsure, asked if his favorite athlete, Rob Gronkowski, painted his nails. Sam's dad, although he wasn't sure, decided to tell Same that yes, Gronk does paint his nails. It turns out he couldn't have been more right. The star tight end shared a special video in response to Sam. Sam also received dozens of pictures of men with painted nails, standing in solidarity with the youngster. As Gronk said, "Do what makes you the happiest." A woman was turned away from a nail salon for her disability. What she got instead was a life-long friend.